How do I stabilise or retain a wall? Anchoring a retaining wall with Vulcan Earth Anchors is a very cost effective and practical means of stabilising or arresting further rotation of a retaining wall. The Earth anchors are installed through the wall face and driven to a pre-determined designed depth before being loaded and locked off against the face of the wall. There are no wet trades required and the anchors are actively loaded during installation to offer an immediate force to retain the wall. How do I stabilise a slope or embankment? Anchoring a slope or slope stabilisation using Vulcan Earth Anchors is a very cost effective and practical solution for stabilising a slope face or embankment. The Earth anchors are installed to a designed depth, that exceeds the depth of the slip plain or angle of repose of the slope. There are no wet trades required and the anchors are actively loaded during installation to offer an immediate force to stabilise the slope. Typically, Earth anchors are combined with the use of structural geo fabrics to offer surface erosion control and to distribute the load of the anchors across the face of the slope. How to prevent soil erosion? Soil erosion problems are caused when the face material of a slope detaches and falls away from the main body of slope. Small (non-structural) earth anchors can used in conjunction with geotextile meshing and fabrics by driving them through the face of the meshing or geofabric thus stabilising the face of an embankment or slope and preventing erosion. Can an Earth Anchor be used to hold down a structure? Yes anchoring temporary or permanent structures using Vulcan Earth Anchors is an extremely fast and cost-effective means of doing so. Earth anchors are a proven method and a replacement to traditional concrete and kentledge. Earth anchors are portable and lightweight, and the installation plant has been developed to allow ease of access and minimal soil disruption. What is an Earth Anchor? A Vulcan Earth anchor is a percussion driven Mechanical ground anchor sometimes referred to as an Earth Anchor or Percussion Anchor. Vulcan Earth Anchors are used as a cost effective and rapidly installed system to provide a positive force. To see how they work please refer to the Vulcan Earth Anchor page. How is an Earth Anchor installed? Depending on the size, depth and soil conditions Vulcan Earth Anchors can be installed using a Maul hammer and drive Rod or a hand held Breaker. For larger projects a machine and an adapter will be required. Method statements and training are all available from Anchor Systems Enquiry page. What is the typical Installation depth of an Earth Anchor? 1 metre to 12 metres. The drive depth is determined through an understanding of the application and the loading requirements. For structural anchoring such as slope stabilisation and retaining wall anchoring, designers should take into account the slip plane or angle of repose to ensure the Earth Anchors are installed into stable soil conditions. However, when anchoring structures such as trees, air domes and utility systems the anchors have pre-determined depths. What is the typical spacing of Earth anchors? Earth anchors can typically be installed as close as 1 – 1.5m centres however a good rule of thumb is 5 x the anchors width apart to prevent load interference. A consideration with closer centred installations is the installation drive angle, especially when working on retaining walls with an external corner. In this case, the anchor installation drive angles and heights can be adapted to prevent an installation clash. Do I need to conduct an acceptability test? In most cases when designing a project and a design load has been specified to support a structure or retain a wall or slope, a site test will be required. The test takes into account the soil conditions as well as any available site conditions, and then determines the correct anchor of choice. This is based on historical and designed holding capacities (see Vulcan capacity chart). The anchor can then be installed to the designed depth and tested to a load that typically will exceed the proof load required by a minimum of 10%. E.G. – a design requires a load of 50kN per meter and a factor of safety of 1.5 = 75Kn. The test anchor will be installed and tested to a minimum of 75Kn +10% = 82.5Kn or until soil mechanics failure to determine the accurate failure load of the soil and the anchor size. This test is the most comprehensive testing regime you can perform to guarantee the design will work. 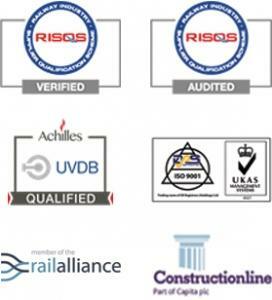 A proof test is a test proving the load each anchor must achieve whilst being installed. The load is the designed working load plus the FOS (Factor of safety).Each anchor must be tested to this load and then released and locked off to the working load. What is the working load? A working load of an Earth anchor is the designed loading requirement that the Earth anchors must retain for the duration of the anchors specified life. What factors determine the design life of an Earth Anchor? A design life is normally specified by the client’s designer. Once these 3 factors have been taken into consideration, a solution can be recommended. Will atmospheric conditions effect the design life of the Vulcan Anchors? Only if the anchors are placed in an area where water is constantly present. If this is the case, the entire range of Vulcan Earth Anchors are available in Ductile Iron and 316 Stainless steel to combat these corrosive conditions. What is soil mechanics failure? Soil mechanics failure is the load that is achieved when an Earth anchor is pulled up through the ground for its entire depth whilst achieving a constant load that fluctuates in a very small degree. How is the structural strength of a Vulcan Earth Anchor System determined? All parts of a Vulcan Earth Anchor System are checked through independent testing. The weakest component’s break load is then reduced by a further 10% and recorded as the Limiting Structural Strength of that particular anchor system. This capacity is usually far beyond what the soil will allow the anchor to achieve so, in some cases, especially in well compacted soils or gravel layers, the anchors achieve high loads allowing the designers to use smaller anchors to achieve the design load required, therefore, offering the most cost-effective solution. How are the loading capacities of each anchor determined? 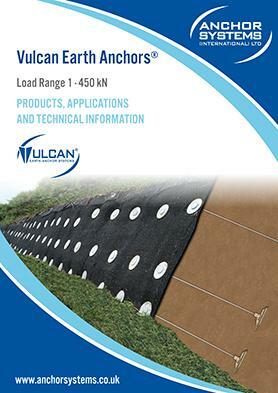 The Vulcan Earth Anchor range has been carefully designed and been named based on the holding capacity achieved in medium to poor soil conditions. E.G. an AS-90 anchor supplied on a 20mm galvanised bar system has a limiting structural strength of 169.2kN. However, in medium to poor soil conditions this anchor will achieve a maximum capacity of 90kN. Anchors that are installed into stiffer substrates they will exceed their named loads. Why was our Holding Capacity Chart developed? Our holding capacity chart was developed using an excess of 25 years of historical site test measurements and readings and soil condition correlation. In addition the capacity chart uses Euro codes and published studies on the sheer strength of a given soil type. What is The SPT (N) of the soil? The standard penetration test (SPT) is an in-situ dynamic penetration test designed to provide information on the geotechnical engineering properties of soil. The SPT value indicates the hardness of the local soil. From this value we can evaluate the expected ultimate capacity of an anchor. Vulcan Earth anchors are best suited in soil conditions with an SPT between 5 – 60. To give the best installation speed and practice a SPT valued between 15 – 35 would be ideal as the soil is soft enough to allow ease of installation and firm enough to guarantee an overall loading consistency. Ductile Iron is a type of cast iron known for its impact and fatigue resistance, elongation, and wear resistance due to the spherical graphite make-up of the material. Ductile Iron is also called ductile cast iron, spheroidal graphite cast iron, or nodular cast iron. Vulcan Earth anchors are cast from Ductile Iron to resist the pressures of installation as well as offering enhanced corrosion resistance.